LOMBOK - 3 For 2 Mix & Match! Welcome to the latest newsletter from LOMBOK and Silverbean. LOMBOK have a new offer live inwhich you can purchase 3 items and get the cheapest one completely free! Discount is automatically applied and the offer is available now until Midnight on Sunday 5th May, while stocks last! In addition to this, new customers can use code: NC15OFF to treat yourself to an extra 15% discount on top of the 342 discount! The code is also valid until midnight on Sunday 5th May. code NC15OFF to redeem the discount. Discount code is valid for new customers only. In Association with LOMBOK's Exclusive Affiliate Partners Agency. dinners and midsummer parties. Summer is a busy time and OKA's new collection has everything you need to get your house and garden prepared for the season. The collection is available from Friday 26th April. New collection launches Friday 26th April 2019 and is available until Thursday 15th August 2019.
on all orders from Friday 19th April until Monday 22nd April 2019. Simply use code FREEDEL419 at the checkout to redeem the offer. promotion/discount and cannot be applied retrospectively. Exclusions apply. OKA are pleased to share a new offer. Enjoy free delivery and 10% off Garden Furniture Sets with code SET10. Offer available now until 12th May 2019. 10% off and free delivery on Garden Sets with code SET10. Valid until midnight 12th May 2019. Valid on full price Grden Sets. Offer cannot be used in conjunction with another promotion/discount and cannot be applied retrospectively. Exclusions apply. OKA are pleased to announce they are offering 15% off online for one day only with the code EASTER19. Available on Sunday 7th April only. 15% off selected full price items with code EASTER19. Valid 7th April 2019. Online only. Offer cannot be used in conjunction with another promotion/discount and cannot be applied retrospectively. Exclusions apply. off in the Mid-Season Sale! LOMBOK are celebrating the launch of their Mid-Season Sale and offering up to 60% off selected items! Discount is automatically applied and the offer is available now until Midnight on Sunday 31st March, while stocks last! In addition to this, use code: NC15OFF and treat yourself to an extra 15% discount on top of the sale discount! The code is also valid until midnight on Sunday 31st March. OKA - 10% off all full price Rugs! enhancement when decorating a room. Enjoy 10% off all full price rugs with the code AWRG19 until 31st March. 10% off all full price rugs with the code AWRG19 until Sunday 31st March 2019. OKA are pleased to offer 15% off all orders with their Spring Shopping Weekend. Simply use the code SPRING19 at the checkout to redeem the offer. This offer is available from Friday 1st march until 23:59 on Sunday 3rd March 2019. Valid from Friday 1st - midnight Sunday 3rd March 2019. Enter code SPRING19 at the checkout. Offer cannot be used in conjunction with another promotion/discount and cannot be applied retrospectively or to delivery charges, exclusions apply. up to 60% off. As you would expect, there are extremely low quantities available and once sold, they are gone forever. Outlet launches on Sunday 17th February. Available from Sunday 17th February 2019 while stocks last.. In this New Year comes an exciting new collection. Spring has arrived and there's nowhere you can see it more than in nature which has been the biggest influence in OKA's new range. Alongside their Spring Collection of over 400 pieces of furniture and accessories, explore OKA's new inspirational look, LA LA Living. This Californian home incorporates a relaxed Californian vibe. Available from Thursday 31st January - midnight Sunday 28th April 2019. OKA - Additional 20% off Winter Sale! beautiful furniture and accessories for your home in their Winter Sale. From Wednesday, you can now save an extra 20% off on top of sale. Simply use code SALE19 to receive the discount. There is limited stock available so do not miss out - Ends Midnight on Sunday. 20% off additional discount only available on Sale category on OKA.com, must use code to receive discount. Code is valid from 00:01 Wednesday 16th January until 23:59 Sunday 20th January 2019. This offer cannot be used in conjunction with any other offer/discount. Discount cannot be applied retrospectively, exclusions apply. OKA - Further Markdowns in the Winter Sale! OKA - Winter Sale Further Markdowns! OKA is pleased to announce further markdowns in their Winter Sale! OKA are offering fantastic savings of more than 50% off on a selection of beautiful furniture and accessories for your home. The sale now features further markdowns. Featuring current items from the Winter Sale including many classic pieces, customer favourites and limited editions to help you start the new year in style. There is limited stock available so do not miss out! Up to 50% off discount only available on Sale category on OKA.com. This offer and cannot be used in conjunction with any other offer/discount. Discount cannot be applied retrospectively, exclusions apply. OKA - New Additions to the Winter Sale! OKA - Winter Sale New Additions! OKA is pleased to announce new additions to their Winter Sale! including many classic pieces, customer favourites and limited editions to help you start the new year in style. There is limited stock available so do not miss out! OKA - Free Delivery Thursday Only! OKA - Free Delivery Today Only! OKA is pleased to announce you can get Free Delivery on all orders TODAY ONLY! December) until midnight. Simply use code FREEDEL1218 at the checkout to redeem offer. Valid today only, Thursday 20th December 2018. UK mainland only. Excludes express delivery. Enter code FREEDEL1218 at the checkout. Offer cannot be used in conjunction with another promotion/discount and cannot be applied retrospectively. OKA - Free Delivery This Weekend! OKA - Free Delivery Weekend! OKA is pleased to announce you can get Free Delivery on all orders this weekend! Enjoy free standard UK delivery on all orders from Friday 7th until midnight on Sunday, 9th December. Simply use code FREEDEL1218 at the checkout. Valid from Friday 7th - Sunday 9th December 2018. UK mainland only. Excludes express delivery. Enter code FREEDEL1218 at the checkout. Offer cannot be used in conjunction with another promotion/discount and cannot be applied retrospectively. Association with OKA's Exclusive Affiliate Partners Agency. Have you already seen our new offers for December? This month we've got great savings across over 40,000 curtains, blinds, furniture covers, decorations and table linen. We have the perfect textiles and accessories for creating some Christmas magic and fabulously stylish homes all year round. Best of all, our offers may be combined and we can also deliver in time for Christmas (for all orders received before 9th December). All Christmas decorations and any other home textiles and accessories may be purchased with additional £30 discount throughout December with discount code DEC30 at checkout. Minimum spend £300. Why wait for Christmas discounts till Boxing Day? Our 15% discount off the entire Christmas collection is starting TODAY. All orders placed before 9th December will arrive before Christmas - so customers can enjoy beautiful festive decor this holiday season! There's still time to create a stunning Christmas table setting with new linen and chair covers, update the sofa bed for holiday season guests with a new cover or quickly refresh tired room decor with trendy bespoke blinds or curtains. We offer an outstanding 5 working days turnover for making all standard and made to measure textiles, which means ALL orders received and paid for before 9th December come with guaranteed Christmas delivery. Browse the whole range on www.dekoria.co.uk or check out Get the Look or Home Trends for expert ideas for simple interior designs with a wow factor and the latest trends. OKA - Christmas Shopping Days - Get 15% Off! OKA - Christmas Shopping Days - 15% off! 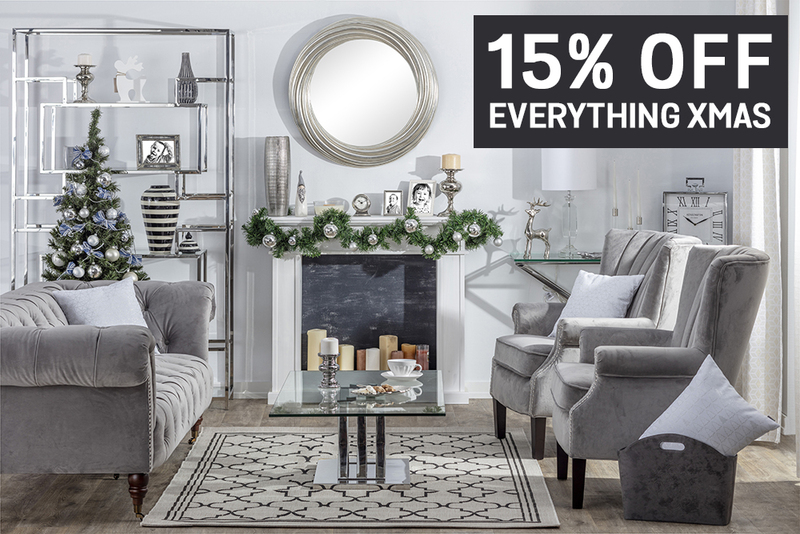 OKA are pleased to announce they are offering 15% off for their Christmas Shopping Days. This offer is available from Thursday 22nd November until midnight Sunday 25th November 2018. Simply use code BLACK18 at the checkout to redeem the offer. 2018. Enter code BLACK18 at the checkout. Valid on in-stock items only. Offer cannot be used in conjunction with another promotion/discount and cannot be applied retrospectively or to delivery charges. Exclusions apply. LOMBOK - 3 For 2 on Everything + An Extra 10% off! LOMBOK - 3 for 2 on everything + an additional 10% off on top! LOMBOK are celebrating Black friday and offering 342 on everything site-wide! SImply choose your items and it will automatically discount the cheapest item. This offer is available now until Midnight on Sunday 25th November. In addition to this, use code: BF10 and treat yourself to an extra 10% discount on top of 342! The code is also valid until midnight on Sunday 25th November. time. Use code BF10 to redeem the discount. Association with LOMBOK's Exclusive Affiliate Partners Agency. At Dekoria we've got some fantastic home & decor offers to help our customers prepare their homes for Christmas. We offer standard and made to order home textiles and we guarantee delivery before Christmas on all orders placed before 9th December! Breathing new life into favourite Ikea furniture has never been easier with slipcovers from Dekoria - made in 5 working days out of machine washable fabric and with 2 Years Warranty! We guarantee delivery well before Christmas too so our customers can spruce up their living room or guest room for family gatherings. No discount code is necessary, our 10% off discount offer is available on all furniture covers shown here. Hurry, this offer ends this Sunday 18th Nov.
FREE fabric samples are available to order online here. 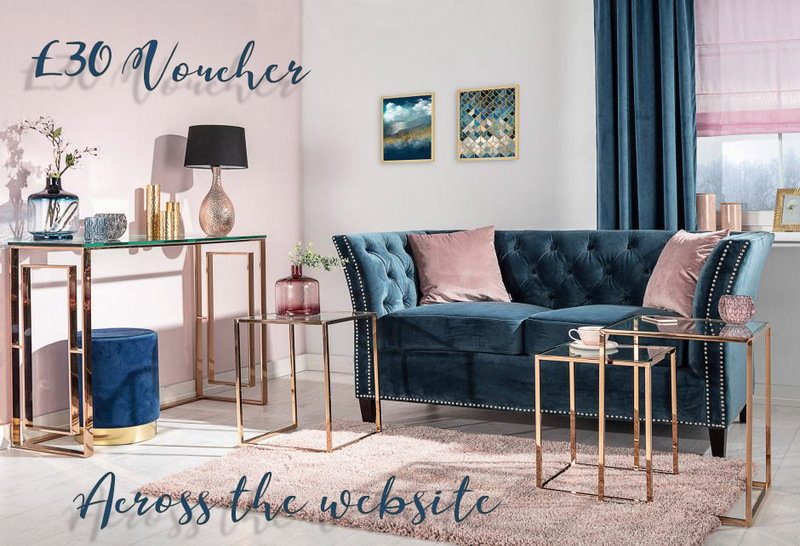 We have a £50 voucher offer valid on ALL orders over £500 placed in November - a helpful way to make updating home for festive time visitors or decorating for Christmas more affordable. Our customers are spoilt for choice with over 40,000 of on-trend home textiles we offer! We have useful Inspirations, Get the Look and Home Trends pages too to help create that jaw-dropping look. We wish you a great month with Dekoria! Dekoria's collection of over 40,000 curtains, blinds, furniture covers and table linen is the best way to create cosy homes and decorate for Christmas and we have textiles and decor for all interior styles, colour schemes and budgets. This month we have 3 fantastic special offers that will help our customers create festive magic in their homes - make sure you promote them early in the month to make the most of this busy time! A perfect way to get the home ready for family and friends' visits over Christmas and New Year - at a fraction of the cost and with a quick 7 days turnaround for making each slipcover to order. 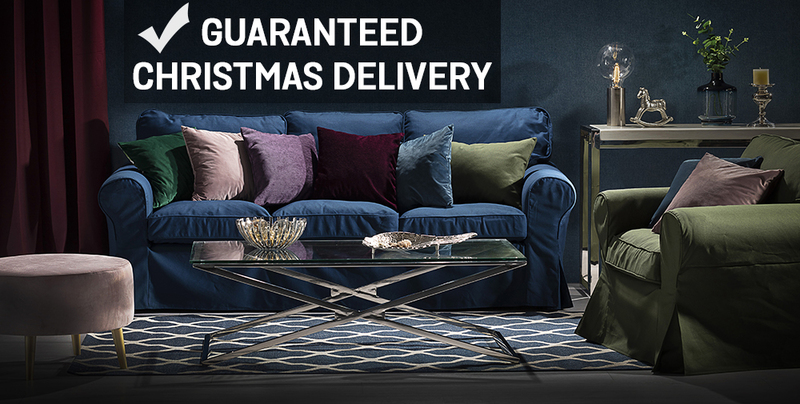 We offer Guaranteed Christmas Delivery at no extra cost across ALL standard and bespoke products (including furniture covers, curtains, blinds, table linen and more) ordered on https://www.dekoria.co.uk before 30th November. We also have a £50 voucher valid on ALL orders over £500 placed in November. A helpful way to make updating home for festive family gatherings and visits or decorating for Christmas more affordable. OKA - Christmas 2018 Collection is here! OKA are pleased to announce they have launched their Christmas 2018 Collection. This range is available from Monday 29th October until midnight Thursday 20th December 2018. Finding personal and thoughtful gifts can be tricky, but thanks to OKA's carefully curated collection, you can tick everyone off your list. 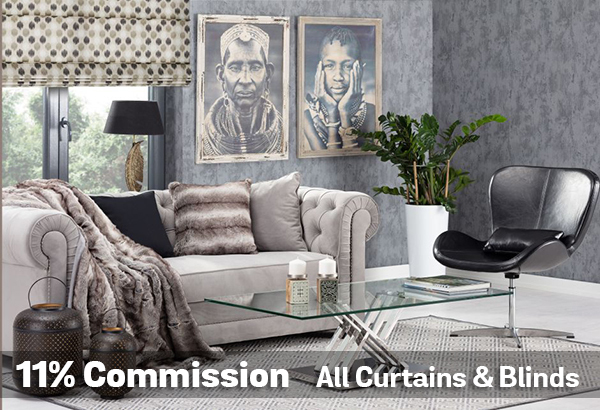 There's still time left to make the most of our increased commission on curtains and blinds sitewide! We have 11% commission (up from the usual 9%) and a £30 voucher offer both active until 31st October. 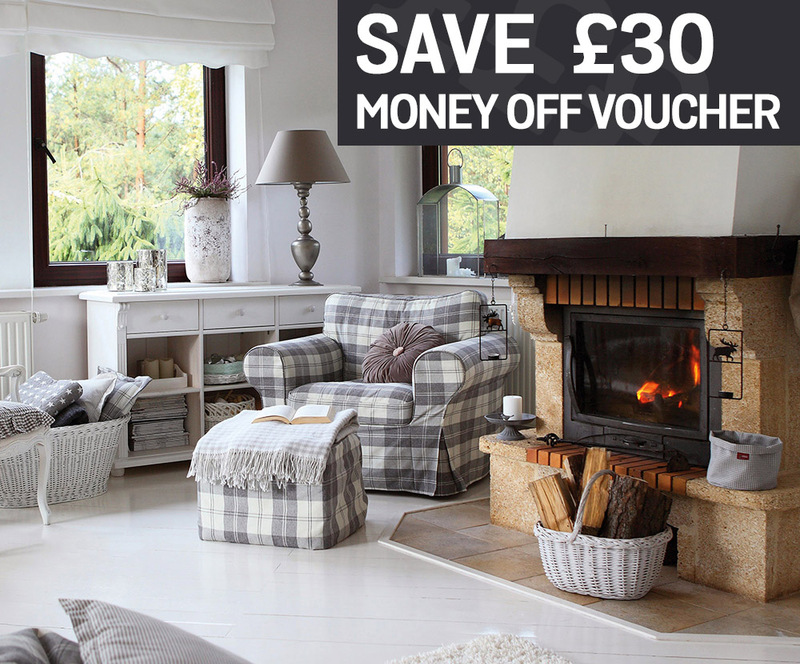 Cosying up for the new season is easier with a £30 voucher to spend across the website. We have a choice of curtains, blinds, seat pads, bolsters and scatter cushions in around 500 fabric options as well as furniture covers and decorations. This offer is valid with code AUTUMN30 applied at checkout before 31st October. Minimum spend £300. October is the best time to replace light and airy summery curtains and blinds with more substantial, heavier fabrics to keep warmth in and to sync home decor with the new season. With a choice of standard size and made to measure curtains and blinds with all types of headings and around 500 fabrics, we have the perfect finishing touch for all interiors and colour schemes. 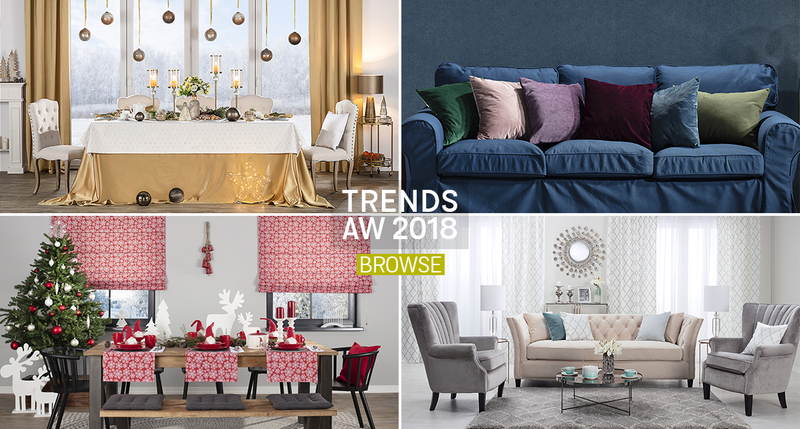 This season's top trends such as lush velvets or elegant dark blue fabrics are definitely worth checking out. Please remember to to replace '!!!id!!!' with your publisher ID when using the deep links. Please let us know on ali@dekoria.co.uk if you have any questions about these offers. OKA - Free Delivery Extended! OKA - Free Delivery - Extended! OKA are pleased to announce they are extending their offer of free standard UK delivery on all orders. This offer is available now and running until midnight Wednesday 24th October 2018. Simply use code FREEDEL1018A at the checkout to redeem the offer. the checkout. Offer cannot be used in conjunction with another promotion/discount and cannot be applied retrospectively. OKA - Online Outlet is back! LOMBOK - 20% off Site-wide! LOMBOK - Anniversary 20% Off Site-wide! LOMBOK are celebrating their 20th Anniversary and offering 20% off site-wide! This offer is available now until Midnight on Sunday 28th October. Celebrate too and treat yourself to something nice for the home from the Autumn/Winter collections.